The curtain has come down, the ovations have rung out, an era has ended. 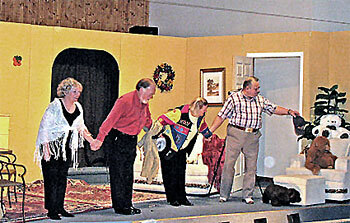 San Felipe Players recently brought their final effort to the stage for dinner theater to benefit Mission San Felipe Church. "Cookin' with Gus" (curtain call to the left) shows the comedic talents of the Lords and the Taylors.....all founding members of SFP who now look forward to new adventures. They thank their loyal patrons for helping this non-profit troop raise thousands of dollars for the benefit of the people in San Felipe. The San Felipe Players was conceived as a thought…a vision for consistent live theater productions presented by local talent throughout the seasons. Several friends shared a few minutes together talking it through and then following it through with action and necessary money, of course. That’s how the SF Players was born more than seven years ago. Two couples looked for plays, built and painted sets, printed tickets, programs, posters and hundreds of other details besides learning their lines, and finally performing. The SF Players now have attained non-profit status from the Mexican government. Future profits will go to the Cobach High School of San Felipe to help complete its unfinished theater. This excellent venue will allow live theater and musical entertainment to Spanish-speaking audiences as well as English-speaking visitors in San Felipe. 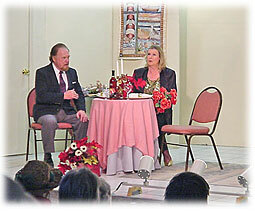 Performances of numerous plays include COMING APART by Fred Carmichael and LO AND BEHOLD! by John Patrick. In March 2005 the 1st Annual San Felipe Folk Festival and Cowboy Poetry Event was held. Other events are in the planning stages for the coming season and years. The San Felipe Players is entering its 7th year, bringing laughter to audiences and financial benefit to the Cobach High School theater project that is not yet completed. When the theater is finished it will be an excellent venue for Spanish and English-speaking plays, musical concerts and many other cultural events for the enrichment of life in San Felipe. The SF Players recent donation purchased two roll-down doors in the stage area. They are excited to donate all this season’s profits toward the next stage of development. Come to the theater and experience the excitement of live performance right here in San Felipe and when you arrive see the progress on the new theater. For this year the San Felipe players are preparing a fun event for your viewing pleasure December 9-11 at Cobach High School Audio/Visual auditorium. The 6-member cast with new as well as remembered faces will give you smiles and tears as you watch them tell the story of Shelby Eatenton in STEEL MAGNOLIAS. The role of Truvy, on screen played by Dolly Parton, will be played by Katherine Hammontre-McKay. The role of Shelby, M’Lynn’s daughter, was created by Robert Harding and brought to life on the screen by Julia Roberts and is performed by San Felipe’s own Wendy Gilson-McCarley. Some may remember Wendy from LO AND BEHOLD! She stole the show as Daisy. STEEL MAGNOLIAS is the story of a close-knit circle of friends whose lives come together in a small parish in modern-day Louisiana in Truvy Eatenon’s Beauty Parlor. The other cast members include Annelle played by Desiree Blair; Clairee will be performed by Julie Houk of Minnetonka Smallflower fame in LO AND BEHOND! M’Lynn is brought to life by Nancy Taylor, with her world of acting experience. Dorothy Biely plays Ouise, the role Shirley McClaine played so well in the movie. You decide who brings the role to you in a more humorous way. Filled with humor and heartbreak, these "Steel Magnolias" make us laugh and cry as the realities of their lives in tiny Chiquapin Parish unfold. There will be four performances in December 2005. This theater affair is as close as you can come to Broadway here in San Felipe but is no less fulfilling. The premier performance will be on 4 December at the South Camps Community Center. Other performances in San Felipe will be at Cobach High School Audio/Visual auditorium at 7pm on Friday, 9 December and Saturday, 10 December. A Sunday matinee will be performed on 11 December at 2pm. TICKETS are available for $10.00 from any of the San Felipe Players, at the El Dorado Swap meet on each Saturday from 7-10am, at the Peoples Gallery, The NET and San Felipe Title Company. You can also call 576-0154 or 577-2913 for tickets. Seats are limited for each performance. 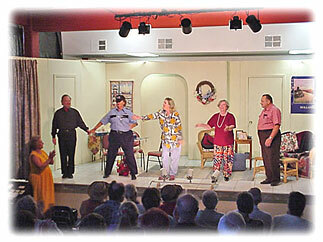 come experience real live theater in San Felipe. The COBACH theatre is also the venue for the Annual Folkfest and Cowboy Poetry Event.